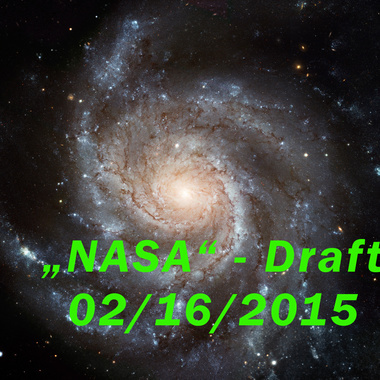 Well, this is my sixth track of "music" at all, carefullly crafted 02/16/2015...This was the very first draft for NASA ( https://blnd.io/1S9A6Xq ). So NASA was my first "big" track. I started here to join blend.io, but did not publish NASA because of concerns in regards to NASA´s copyright. Anyway their great files are CC, what I realized later :) (Already at Test6 embedded soundclips copyrighted by NASA (http://www.nasa.gov/connect/artspace/participate/royalty_free_resources.html). Pls. critizize or pull, respecting the copyrights from the sources.) Thank you Michael PS Cover image based on "Messier 101 (M101), Pinwheel Galaxy" by Robert Sullivan on Flickr.